National and local charities offering advice and support for people and families affected by catastrophic injury. A national charity with regional branches that exists to support people who use augmentative and alternative communication (AAC). The charity provides support and quality information to people affected by brain and spine conditions, in order to reduce anxiety and help inform their choices. It provides a free helpline staffed by experienced neuroscience nurses. The Brain Injury Hub, developed by The Children's Trust, provides information about brain injury in an understandable language to help parents, teachers and families on their on-going journey following a child's brain injury. A support group for people who have loved ones with devastating brain injuries: they may be severely disabled, in a persistent vegetative state, minimally aware/conscious or locked in. Online forum and telephone helpline. Belfast-based employment and re-employment advice; employability services are aimed at people (age 16+) with disabilities including physical and sensory disabilities and brain injury. Northern Ireland. Voluntary organisation run from Kent, the Trust gives grants to people all over the UK to enable them to continue to garden, despite disability or advancing illness. The UK's largest meningitis charity offering support, funding research and raising awareness. Supply and design standard and custom made disability equipment for children and young people. Part of Queen Elizabeth’s Foundation for Disabled People Family of Charities. A Facebook support group for the families, friends and carers of people in a persistent vegetative state. The UK’s leading charity for children with brain injury: providing rehabilitation to help children make the best recovery possible after a serious accident or illness at national specialist centre in Surrey and in the community. The brain inflammation charity providing advice and information, raising awareness and funding research. Offers expert help via phone, Skype and email. Small national fundraising charity that aims to help disabled members reach their full potential through the provision of suitable communication equipment. Search by postcode to find live-in care providers in your area. A national charity that uses gardening to bring about positive changes in the lives of people living with disabilities or ill health, or who are isolated, disadvantaged or vulnerable. Projects in Reading, London and Birmingham. National body that aims to promote and develop wheelchair dancing as a sport and leisure activity across the country. Groups around the UK. Wheels for Wellbeing supports disabled and older people to get cycling across the UK. National charity supporting children and young people aged 25 and under with epilepsy and associated conditions, as well as their families, providing diagnosis, assessment and rehabilitation; also undertakes research into the condition and how it can be treated. Aims to support and improve the quality of life for people with ABI, their families and carers, offering advice, information and resources. Headway Edinburgh Group aims to empower and enrich the lives of adults who have survived an acquired brain injury by providing high quality person-centred rehabilitation services which support both adults with brain injuries and their carers. Runs support groups throughout the Highlands and offers access to a free accredited counselling service; also signpost other organisations and services. Supporting brain injury survivors, their carers and families in Huddersfield and district. We cover Kirklees and Calderdale areas and have members from Wakefield. Headway Gwynedd and Mon supports brain injury survivors and their families/carers, all welcome at our monthly support groups across North Wales. The Carer Support Team offers a range of support for carers of adults living in Wolverhampton. A valuable source of help, information and support for people with brain injury, their carers and families within North Staffordshire for over 30 years from its base in Stoke-on-Trent. Headway Shropshire is a Shropshire based charity established in 1989. Our specialist service provide support to people over the age of 18 with an acquired Brain Injury, the families, carers and professionals in the Shropshire and Telford and Wrekin Area. Brain injury hubs in Worcester, Kidderminster and Bromsgrove; outreach services across Worcestershire. A national charity that uses gardening to bring about positive changes in the lives of people living with disabilities or ill health, or who are isolated, disadvantaged or vulnerable. Projects in Birmingham, Reading and London. 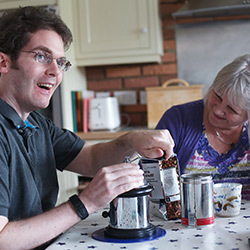 A charitable organisation providing support and services to individuals, family members and carers affected by an ABI. Based Irthlingborough. Charity supporting independent living. East Northamptonshire. Range of specialist services delivering tailored care to support people with complex, acquired and progressive brain conditions. Committed to becoming a national centre of excellence. Independent charity providing meals on wheels to the elderly and infirm in Cambridgeshire. Supporting people with a brain injury and those who care about them from two hubs in Peterborough and Fulbourn. Programme of activities and specialist services aimed at recovery and social rehabilitation. A charity for people with aphasia, a communication disability which occurs when the communication centres of the brain are damaged. It is usually caused by stroke, but can also be caused by brain haemorrhage, head injury or tumours. Provide life-changing learning for children and adults with cerebral palsy and other movement disorders. Works to provide assistance, support, information and services to people with a brain injury, their families and carers, and the professionals working with them. Monthly group meetings in Wimbledon, Croydon, Richmond and Balham. Assistance, support, information and services for people with brain injuries and for their families, carers and relevant professionals. Group meetings in Fulham, Hammersmith and Paddington. A national charity that uses gardening to bring about positive changes in the lives of people living with disabilities or ill health, or who are isolated, disadvantaged or vulnerable. Projects in London, Reading and Birmingham. Wheels for Wellbeing supports disabled and older people to get cycling in South London and across the UK. Supporting adults across West Kent affected by brain injury, either as a result of an accident or illness from our centre in Tunbridge Wells. Offer support in the community through Community Wellbeing Support Groups (Maidstone, Sevenoaks, Tunbridge Wells) and a programme of activities. Helping children make the best recovery possible after a serious accident or illness at national specialist centre at Tadworth, Surrey. Specialist residential and respite care for ex-servicemen and women who require nursing care and rehabilitation. Provides long term support to adults over 18 years with confirmed diagnosis of brain injury, and to their families and carers. Affiliated to Headway UK.